It’s been a glorious day of sun and warmth here in southern Spain … a slow lazy start to Sunday with a swim before breakfast and later a trip into nearby Moraira for a drink by the sea looking over the marina, then lunch in Raco de l’Arros, a traditional restaurant specialising in paellas and arroces – which is similar to a paella but softer and creamier and not cooked in the typical shallow paella pan but a deeper casserole. 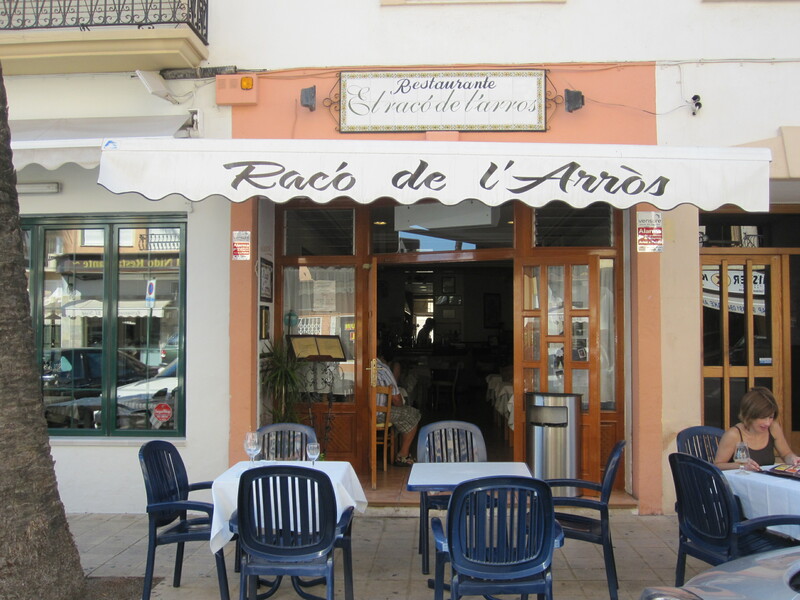 The restaurant is run by husband and wife, Fernando and Rosa. Fernando was a very welcoming host and told us that Rosa does the cooking. They’ve been there for eleven years but the restaurant has a feel of being much older with its traditional tiles and decor and their obvious passion for serving authentic dishes. We ordered a salad to start and Fernando stressed that a typical Valencian salad contains simply lettuce, onion, tomato and olives and anything with lots of extras wasn’t the real thing. Then the paella came: what we noticed immediately was that it wasn’t bright yellow – which was a good sign. Many restaurants use a lot of yellow colouring to make it look as if they’ve added lots of saffron (though actually you wouldn’t want too much as it upsets the stomach if you add a large amount!). Full of langoustines, large delicious prawns, mussels and clams it was a very good paella and we all thought one of the best we’d had. The restaurant was busy. Sunday lunchtime is the most popular time for locals to come out for paella as it’s a dish that’s eaten only at lunchtime by the Spaniards who consider that rice isn’t a good thing to eat in the evening. We were glad we’d booked. After some excellent coffee and a digestif each on the house, we headed off for a post-prandial walk by the sea. We drove a little way out of the town to join a coastal walk which has been set up as an ecological/nature reserve with a beautifully laid out path along the cliffs and magnificent views. With the sun high and the sky clear blue, the sea was a wonderful azure and turquoise colour. A perfect way to gently walk off a lovely lunch before heading back home … to cool off in the pool again.